With our success in securing a National Monument designation for the Berryessa Snow Mountain region, Tuleyome needs volunteers now more than ever. Volunteers are a vital component of our projects and programs, and we hope you’ll consider signing up as a volunteer today! We can also accommodate groups of volunteers with one-time or on-going opportunities. We contact volunteers through email blasts, but you can also find out about what opportunities are coming up by watching our Events Page, "liking" us on Facebook, and "following" us on Twitter. 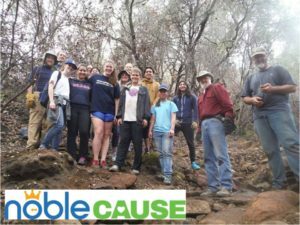 Tuleyome thanks NobleCause for its grant to help fund our volunteer opportunity advertisements, support our #DonateToRestore volunteer efforts, and purchase equipment for our volunteers in 2016.